Ingredients: Calcium carbonate, sorbitol, aqua, glycerin, silica, xylitol, mentha piperita (peppermint) oil, citrus medica limonum (lemon) extract, calcium ascorbate, melaleuca alternifolia (tea tree) leaf oil, menthol, sclerotium gum, coco glucoside, xanthan gum. Paraben or hydantoin preservatives, sulfate detergents, artificial aromas, fragrances or dyes, phthalates, quaternium, EDTA, propylene glycol or petrolatum, Fluoride, artificial flavours or aromas, dyes, sodium lauryl sulfate (SLS), chemical whiteners, propylene glycol, preservatives. Love this product! Feel good using it knowing that it's not tested on animals and has less chemicals for my family. Mild mint flavour is great as I don't like the strong mint flavours of other brands. Love the taste and the fact that it's a natural product. Love this product. All natural and Canadian. Doesn't get better than that. Excellent product as all Green Beaver products i have used are. I'm a fan of all the Green Beaver products...been using them for years. They provide excellent quality, all natural products and proudly Canadian. Would highly recommend! I really wanted to love this, since it's hard to find a nice natural toothpaste, however I was not a fan of it. It didn't give me as much of a clean feeling as I would like. Was in the process of switching to a more natural household, and toothpaste took me the longest to find one that did not leave my teeth feeling half clean. This toothpaste works well at cleansing the teeth and giving you a fresh taste after brushing. I would recommend though as this toothpaste does not have fluoride, to use a mouth wash to go along with your brushing routine once a day to not loose the flouride our teeth need. Other then that I'd still ecommend to give it a try! Excellent natural toothpaste. Proud to support a local and Canadian product. This is our favourite natural toothpaste! This has been my toothpaste of choice for a few years now. I've gotten away from toothpaste containing fluoride and other ingredients I'd prefer not to ingest. 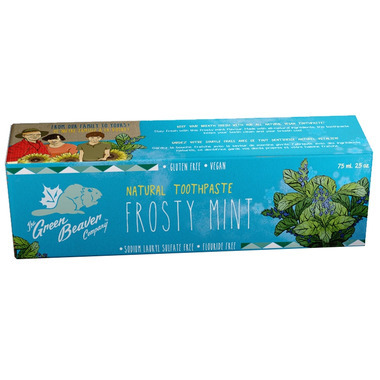 Green Beaver makes a variety of flavoured toothpastes, some of which I have on hand for my grandchildren as they're safer than many of the mainstream toothpastes. The frosty mint is my toothpaste however. It's pretty potent, but very refreshing! I have used this toothpaste for years and my family loves it. It cleans well and the frosty mint flavour is our favorite. This is the only toothpaste I've used for over 12 years. It's also my granddaughter's favourite toothpaste. Effective, and tastes good. None of the Big Brand names offer natural toothpaste let alone a cruelty free alternative. I love this stuff & the frosty mint is my hubby's favourite flavour! My 1, 3 and 5 year old enjoy using this toothpaste and I enjoy knowing that it's safe for them. Frosty mint is my fave! The best natural toothpaste I have tried. Makes your teeth feel clean and also love the mint flavour. Iâ€™m so picky about toothpastes and this one does not disappoint. Tried this today along with Nelson Naturals as I was looking for an environmentally conscious toothpaste made in Canada. Switching from regular toothpaste (e.g. Colgate) is... weird. It has a mildly chalky texture and the scent/flavour of mint is minimal at best. It seems to clean the teeth just fine though it's leaving a white residue on my tongue while brushing. I do wish that the packaging was more environmental as (as far as I know) no municipality in Canada is able to recycle toothpaste tubes. Rating: 3.5/5. This is hands down the best natural toothpaste out there (squiggle, Tom's, Jason, earth paste, powder ones etc) I've tried nearly every one and none work as well, taste as good and are as effective as this for fresh breath. This is my favorite toothpaste and I am extremely picky! Switched from regular toothpaste to this brand a few years ago and havenâ€™t looked back. I love this toothpaste. Leaves my teeth feeling nice and clean and the bonus for me: it's not tested on animals; therefore, cruelty free. meh, i don't really go for this. Great Toothpaste. I have been using this as first toothpaste for my kids. The mint is too strong for them, but the green apple they love! Love it. This was our switch to from regular toothpaste. My favourite toothpaste & flavour. The only tooth paste that we use, great product!!! This is the best natural toothpaste I've ever used and this is my favourite flavour! Best natural paste out there. Great flavor, too. I keep buying over and over again. Iâ€™d never use anything else. Only wish there were larger tubes. This is our go to toothpaste. We love it! Weve tried the orange flavour and the spearmint which are both good also but the frosty mont is our favourite! I must admit I havenâ€™t used it much, but do like the taste and love that itâ€™s all natural and made in Canada. This is my favourite toothpaste. My teeth used to be sensitive, hurting when I brushed, but with the use of this toothpaste I no longer have this problem. Can even eat ice cream. Got to love it. Love it, it is the only toothpaste I use. Teeth are far less sensitive than they were when I used that famous "Sensitive" toothpaste. This toothpaste ticks all the right boxes as a Canadian company that is cruelty free & offers a completely natural product that does not cost a fortune. This flavour is my hubby's favourite. My second, I really like the apple flavour. Quite like this product, the minty flavour is nice, good texture, weâ€™ve been using it for over 2 years now. Better than other natural toothpastes I have tried. Mild minty flavour but has a subtle not so nice after taste. Not the best "paste" as the product was quite runny. Maybe I got a bad batch? Didn't get the fresh clean teeth feel after either. My first "green" toothpaste, this is still my back up brand (LOVE to support Canadian companies). But I have more recently been using a salt based toothpaste and now this tastes too sweet ! This is my favourite toothpaste. The toothpaste contains coco glucoside which gives me a rash. I didn't expect to find this ingredient into a toothpaste. My daughter's go-to toothpaste! And Canadian!